DO YOU KNOW your neigbours? That’s a question being asked by youth organisation Macra na Feirme ahead of its Know Your Neighbour weekend. The initiative, now in its seventh year, wants people to take time out to socialise with their community – you can register an event and download tips, ideas and resources at knowyourneighbour.ie or by texting KYN with your name and address to 51444. There are prizes of a SAORVIEW-approved TV and a One for All voucher worth €150 for the best photos of a Know Your Neighbour event – you can send your event photos to macranafeirme@gmail.com. 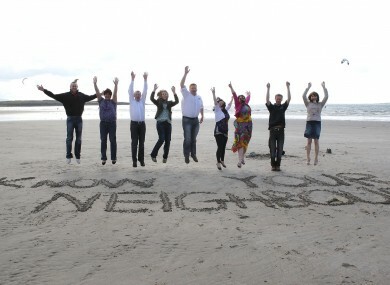 There is a serious purpose to the Know Your Neighbour weekend (it’s on 14 and 15 July) - a survey last year found that only 57 per cent of Irish people know their neigbours well and interact with them on a regular basis. The growing trend of people living alone, coupled with longer life spans, increases the risk of social isolation for some people. Here are a few more extreme suggestions… just for fun. Don’t try all these at home. Or a pillow fight... or a potato fight... This is a scene from the annual tomato fight in Sutamarchan in Colombia. Pic: AP Photo/Fernando Vergara. Get everyone to bring over the books they no longer need. Pile them on top of each other. Ta-daa: A literary tower. (Alternatively, you could do something good with it, and donate them all to charity). Pic: AP Photo/Jacquelyn Martin. You'll find on your return that you will be VERY well known among your neighbours. We can't guarantee you'll be well liked though. Pic: Matt Crossick/EMPICS Entertainment/PA Wire. Do it for charity and get all ages involved: after all, if this 97-year-old man, George Moyse, from Bournemouth, England, could do it... Pic: Dave Pratt/PA Wire. Do you have any sensible ideas for a street party? Let us know in the comments below. Email “How to get to Know Your Neighbour”. Feedback on “How to get to Know Your Neighbour”.